Now wait has finished, no need to compress our mobile data to store in the mobile or any gadget.. You know why i ma saying to this because 200GB microSD has availabe in the market.. You can buy this product from many shopping website like Amazon etc.. This has been officially announced 200GB microSD Card has come in the market for the technolover..
if you are worry to store your data in the multiple memory card like 16GB, 32GB or even 64GB so time has over to wait and go to amazone and purchase your first world 200GB microSD card. 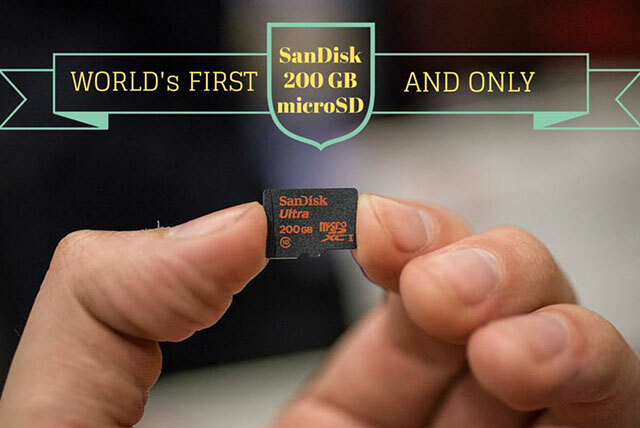 Early in the March when Sandisk first announced the world’s first 200GB microSD card. Then we were thinking cost should be of this miracle product more than $400 but this cost is $240 has been marked as the price for the highest-capacity microSD card availabe in the market. The company claims that the speed will allow you to transfer up to 1,200 photos in just a single minute. The card is something of great use for photographers and filmmakers who need more storage capacity to store high-resolution photographs and videos. Moreover, Sandisk’s 200GB MicroSD card comes packaged with an SD adapter and a 10-year limited warranty. Furthermore, the 200GB MicroSD card is waterproof, shockproof, temperature proof, magnet proof and X-ray proof to deal with any possibility of destruction. However, if you can not spent this much for 200GB of storage space, there always remains an option for you to buy a 128GB MicroSD card that still provides you plenty of space and costs as much as $80. Thanks a lot for sharing this useful information with us.. Your Always most Welcome !!!!!!!!! Great post. Will undoubtedly be back for more quality information.